Turf pavers allow for grass areas to support vehicular traffic. Turf pavers (grass pavers) provide a reliable solution for grassy areas which require sub-surface reinformcent due to vehcular traffic. 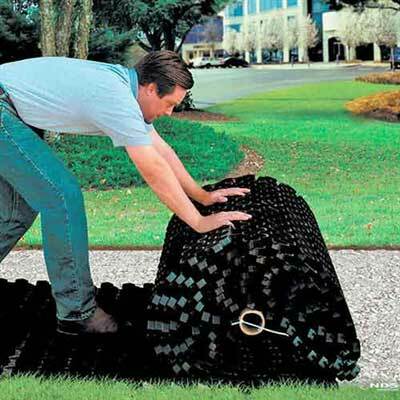 Turf pavers will prevent rutting and and tire marks and can withstand the weight of virtualy any vehicle. These products are avaialbe in both roll and panel form and can be installed in both flat areas and slopes with up to a 15% incline. Turf Paver Installed Undrneath Turf. Grass pavers are a grass reinforcement system that is designed to stabilize soil and transfer the weight of vehicles while protecting grass's delicate root system. It is manufactured in reinforced 24” square panels from 100% recycled HDPE. These panels offer a compression strength of 81,744 psf. 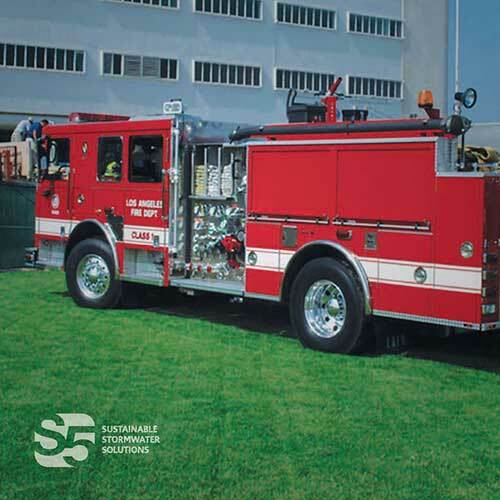 Tufftrack is a very tough material that can support the weight of even construction vehicles and firetrucks because of its compression strength. These pavers give a lasting and beautiful answer for areas that have constant heavy traffic which pre-grass pavers had to be constructed of either asphalt or concrete. NDS Tufftrack Pavers have three new features that set it apart from competitors. They offer super easy to install clips that allow for quick installation. They offer domed drainage outlets and allow for free movement of water between the cells. Its webbed cell design allows it to be used with both grass and gravel fill. The new Tufftrack paver panels have a strong clip designed to easily allow top-down installation. Just put the male clips of one panel onto the female clips of the adjacent panel and push down to lock them in place. This design cuts down on installation time by half from older designs. The new clip design gives both the traditional square application and the offset configuration add shear strength. The traditional square application permits for flexibility on areas such as hillsides, while the offset configuration will stop pavers from separating when under stress from heavy loads, such as firetrucks. NDS Tufftruck is manufactured with a webbed cell that keeps fill material where it belongs, preventing gravel from slipping under the paver. It lifts the cells while creating an environment that permits root growth in the cell. This makes for an ideal system for both grass and gravel operations. The webbed cell design has support ribs that will allow gravel that is 3/8” or larger to be used as a filler without needing additional materials to keep the filler in place. This design also offers a great stability for slope installation because stakes may be driven into the ribs. Inside the cell wall of the New Tufftrack paver are unique domed drainage holes that allow for sideways motion of water and nutrients. This also allows water to drain much quicker, making Tufftrack the perfect solution for rooftop gardens and sports fields. Water can drain downward as well as sideways. Tufftrack gives a penetrable surface that cancels out or minimizes storm-water runoff. It's unique design allows for increased sideways movement of water and nutrients. Thereby, storm-water will filter naturally through the subsurface and reduce pollutants. Have you ever noticed, while watching the weather channel, that cities often have a temperature that is a few degrees higher than the surrounding areas? An urban heat island (UHI) is a city area that is significantly warmer and is caused by human population activities. The urban heat island effect applies to the theory that diminished grass cannot absorb the heat or energy level of hard surfaces. Tufftrack Pavers are made from a 100% recycled plastic allowing grass to continually grow. Tufftrack offers a very high compression strength up to 81,744 psf empty before filling. It's unique tongue and groove clips are very easy to apply which in turn cuts back on installation time by half and reduces labor costs as well. 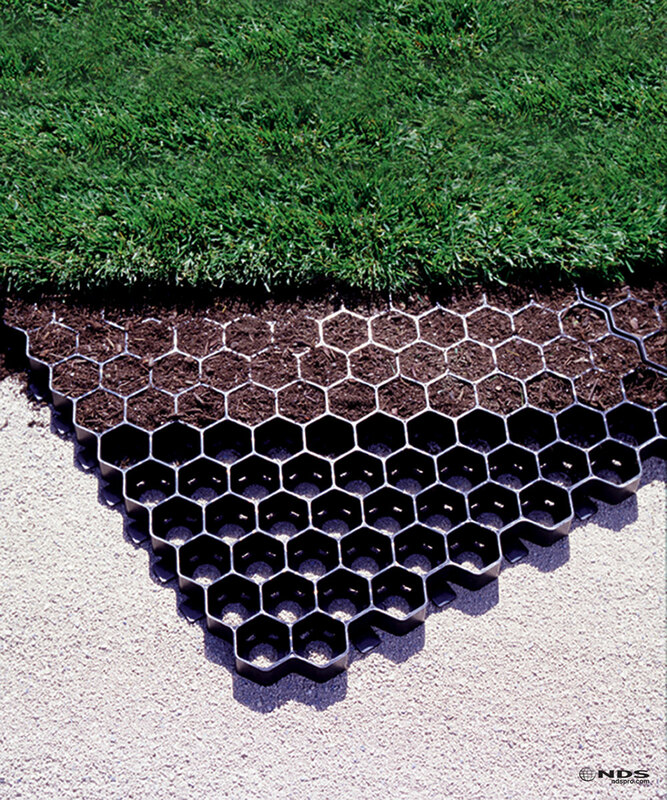 The reinforced grass root zone is protected by a grid work that consists of hexagonal cells. This allows for healthy grass growth even under strenuous circumstances. Tufftrack lessens the demands put on to landscape drainage systems. Using Tufftrack is less costly to maintain over a period of time vs traditional hard surfacing. It offers a more beautiful and pleasing appearance vs traditional hard surfacing. 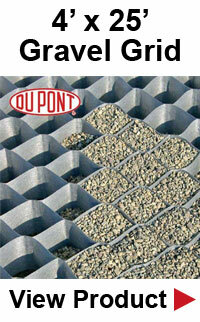 Tufftrack may be used for both grass and gravel applications thanks to its webbed cell design. Rolled paver being unrolled over a layer of compacted aggregate. NDS EZ Roll Grass Pavers are a permiable alternative to traditional paving methods. This method protects root zones and prevents soil compaction allowing for drivable grass areas without damaging the turf. This allows for healthy grass to thrive in areas that, previously, would have never happened. NDS EZRoll is also an excellent choice for erosion prevention on slopes and swales (a low place in a track of land). These turf pavers are a great deal less expensive to take care of and maintain over long periods of time vs standard hard surface alternatives. Tufftrack gives a penetrable surface that cancels out or minimizes storm-water runoff. It's unique design allows for increased sideways movement of water and nutrients. Thereby, storm-water will filter naturally through the subsurface and reduce pollutants. Adding to that, it is UHI effective because diminished grass cannot absorb as much heat as hard surfaces, therefore, these pavers are made from 100% recycled plastic allowing grass to grow. Empty cells have a compression of 57,888 psf. The product ships in large rolls for easy roll-out. The grid work, which are hexagonal cells, will protect and reinforce the grass root area. Not only is this a very effectual, working system, it will also add a beautiful appearance that is unsurpassed. This system reduces all stress on the landscape drainage structure.